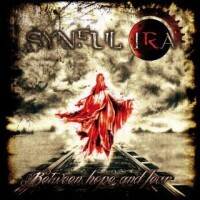 SYNFUL IRA is an Italian Gothic Rock/Metal band, inspired by EVANESCENCE and NIGHTWISH. Or rather, they started by covering those two bands. This soon evolved into writing own material. First proof of that was the demo “The Hard Reality”, which came out in 2010, three years after the band’s founding. You can read my review here. Two years later, the band’s debut full-length sees the light of day. In June 2012. For this they signed to the italian label Logic(il)logic Records. “Between Hope And Fear”, the title of this release, counts twelve tracks, of which 5 were also found on the “The Hard Reality” demo. This leaves seven entirely new songs to complete the list. The album begins like the demo with “Sound Of Life”, the intro of the album. You get clean guitar work, a solo and atmospheric backing. This piece alone sounds close to SAVATAGE, which is of course very nice. Then the keyboards (piano) come in to take over and Letizia Chiozzi begins the speech. This connects neatly with the song “True Lies”, where the music comes bursting in. And yes, melody is key and it does sound like what you would expect from a Gothic Metal band. The guitars offer heavy grooves, though with melodic leads, assisted by the piano. The clean verses are first like the aforementioned intro, then power is added. And the whole gets melancholic in the chorus. Letizia’s voice, I must admit, sounds similar to that of Carla from LA-VENTURA. “Behind The Suspect” also has clean guitar work at first, with soft symphonic backing. Again SAVATAGE comes to mind. When drums and bass – and this one even gets spotlight attention – fall in, the building really begins until all elements are ready for take-off. Dark riffing, symphonic (keyboards) leads.. and go! Result? Fast double bass Power Metal, which is a bit suprising (and not) if Fabio created SYNFUL IRA to play a different kind of Metal than with ANCIENT BARDS. The piano is a key instrument in this song and you get a nice contrast between the verses and the chorus, which is touching/emotional/dark/gloomy. “Shining Tracks” is a midtempo groove Metal song with Gothic influences. It does sound like a power ballad, I must say, but that’s only a thought. As the song advances, all doubt is removed. The guitars counter with the piano melody and Letizia’s soft/dreamy vocals. The chorus – preceded by the symphonic bridge, so to speak – is where all power, rather atmospheric, is unleashed, creating a hymnic piece. I like it. However, I do want to add that the vocals could have been done with more passion. Or the music given a bit more punch. The (Bluesy) guitar solo that follows is inline with the rest of the music. “Fatal Temptation” is much lower in the list, but for the sake of ease I’m mentioning it now. The blunt riffing reminded me of FEAR FACTORY and DIVINE HERESY. Following is a funky midtempo part with electronic backing. Compared to the previous songs, I have to say the band did take care of the variation aspect of this release. The keyboards confirm their dominance in the melodic department. Full power is saved for the chorus, which is again well done, but sounds like Pop with distorted guitar input. The comparison with the Dutch band LA-VENTURA cannot be avoided. Not that it’s a bad thing. On the contrary even. And so we come to the new songs. “Revenge Of Mind” starts with a mysterious, oriental-sounding intro. The violin also plays a part in this piece. Come to think of it, see METALLICA’s “Wherever I May Roam” intro. Tension rises, as the music comes through in bursts, and with symphonic backing. And then the drums pound their way onward, together with the groovy guitars. The synths make it complete. Think DREAM THEATER (albums: “Awake”, “Train Of Thought”, “Systematic Chaos”). The clean vocals contrast nicely with the heavy music. The chorus is once more the part where the tempo drops and the music becomes more melodic and dramatic. The oriental theme returns twice, before the keyboard solo and at the end of the song. Good stuff from start to finish! What this album so far mainly lacks, is balls. Sure, the groovy guitars are heavy, but somehow in the compositions (and perhaps production) a bit more bite wouldn’t hurt. “Inside My Fears” seems to the song willing to go a bit further (farther?) in that perspective. Piano leads contrast with the guitars and drums. The feel of the song is similarly dark to the other ones. Uptempo Power Metal was again applied to the verses, where the vocals also underwent a change: they’re more driven. Speaking of vocals, the chorus has a duo of them, both clean. The male version, I’m sorry to say, sounds… out of place. Let’s keep it at that. Other than that, the band’s got another good song in the bank. Time for a more modern sounding song then: “My Friend”. Its Techno intro really cheered me up. No, it didn’t. I’m no fan of such music. Anyway, when the rest of the instrumentation is added, the situation improves. Guitars dominate here, while the synths clearly remain in the back. However, they are put to the front a little more when it’s chorus time. And this is no different from the rest of the songs. Predictability? Plus, it’s as if the band doesn’t dare to push the pedal in this specific part. Solos were not forgotten and are delivered by the keyboards and guitar. How about a little break from all the heavy guitars and drums, ey? “Hope” brings in the acoustic guitar and thus a bit a sonic enlightenment. However, the grooves are not far off, yet the song does not grow into a powerball. It remains what you could call a heavy power ballad. Like before, the keys operate from the back, come to the front in the chorus, where the vocals sound more passionate, so to speak. A piano-drive bridge follows later, as does an acoustic break leading to the solo moments. After that it’s back to the chorus and heading for the ending. “8.45” is a track consisting of piano only, sounding solemn and atmospheric. This connects directly with “New Love”, again comparable to SAVATAGE. When the song takes off, it’s a midtempo, rather Poppy Rocksong. Full Poppiness is let out in the chorus, where the violin returns by providing accents. A break, though musical and with male speech, leads to the solo. While this is another dark song, I’ve got the impression it’s got a more hopeful basis. Last but not least, there’s “Destiny”. See IRON MAIDEN’s “Aces High”, but slower. Midtempo melodic Rock kicks in, the groovy guitars keeping their dominance, while on a whole this song sounds so similar to a previous one (“Behind The Suspect” I’d say). Also, the drum pattern (involving the china cymbal) is used a bit too often, which makes it not that attractive/interesting, in my (humble) opinion. Can I say it’s rather boring? Other than that the compositions are like before. However, there are solos aplenty here. All ends in a clean (sounding) way. Long story short: the demo, “The Hard Reality” was very promising. And so is this full-length, “Between Hope And Fear”. The production is very good, the musicianship ditto. And yet, not all is well. The songs are very linear. That’s a choice one makes, so in se nothing wrong with that, it’s doesn’t always have to be technical or complicated to be good. And it is good, make no mistake. But it harms the listening experience. The pattern applied to the songs is in most cases the same, meaning more variety is welcome. That’s the/my main issue. “Between Hope And Fear” is, all things considered, a good album.